This will be the first thing that your special someone will see, so it needs to look good. It’s a good idea to repair anything that needs fixing before you clean and paint it. Giving it a quick onceover will give you a chance to notice any loose parts or obvious signs of disrepair. You might be able to fix some of these issues yourself but when it comes to the more complex components, such as your torsion or extension springs, its best to call in a trained professional. You would also need to check your door’s corresponding automatic opener. After ensuring that everything is working the way it’s supposed to, it’s time to work up a sweat. Make sure that you have the correct cleaning products to properly clean your door. This might differ according to the material of your door. You may then also need to get an additional product if you have a sectional door with glass panels. A fresh coat of paint will give your house an instant facelift and will enable your door to act as the perfect canvas for writing a beautiful message for Valentine’s Day, or for creating a romantic picture for your loved one. If you have a steel garage door, you could even use simple magnets as effective décor for your door. How about a glass door? LED and fairy lights are perfect for this! Just be careful that the decorations won’t interfere with the functioning of your door, especially if you have an overhead garage door. Draping a simple white sheet across the door will give you an instant big screen. Now all you need is a projector, and some romantic movies, and you’re good to go! You could also hang some more fairy lights around your big screen for some added magic! 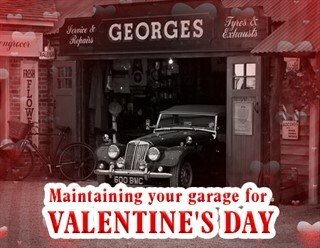 Your humble garage has so much potential to be turned into anything you want: a romantic restaurant set up for two, a dreamy deserted island or even a movie theatre! You would of course first need to pack any miscellaneous items away and then apply the same cleaning and painting principles to the interior of your garage. This is where your imagination can run wild! You can think up any design and just use your creativity to decorate the garage. Using this space will not only save you money, it will offer a unique venue to host a memorable Valentine’s Day that your loved one will remember for years to come!